Here’s a frozen lemon dessert that isn’t a sherbet or sorbet. 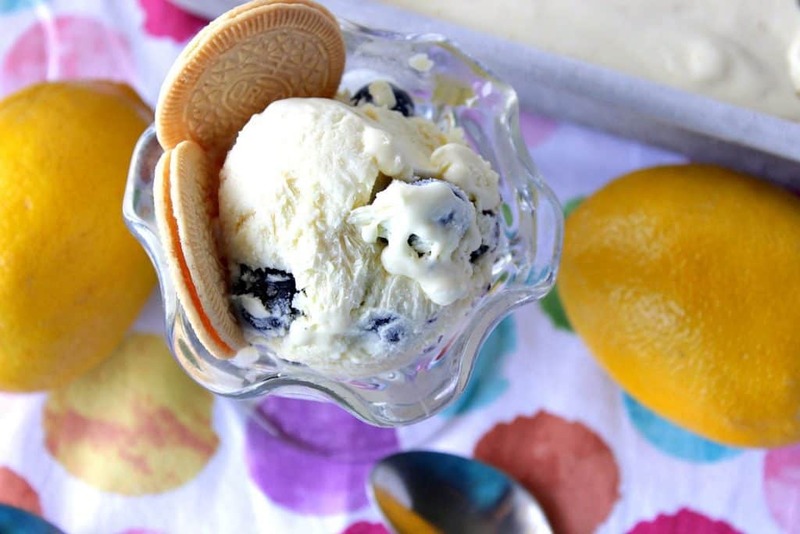 Luscious Lemon No Churn Ice Cream with Blueberries and Malibu Rum is rich and creamy with just the right amount of tart and sweet lemony flavor. I do have an ice cream maker. I won it in a giveaway contest that another food blogger (Elle, from Elle’s Kitchen) ran several years ago. Normally I would link to Elle’s site so you could visit and check it out, but sadly Elle passed away several years ago, and her site is no longer running. While I do love using the ice cream maker I received from Elle, and it always brings back fond memories of the friendship she and I forged, lately I’m all about making ice cream the “no churn” way. 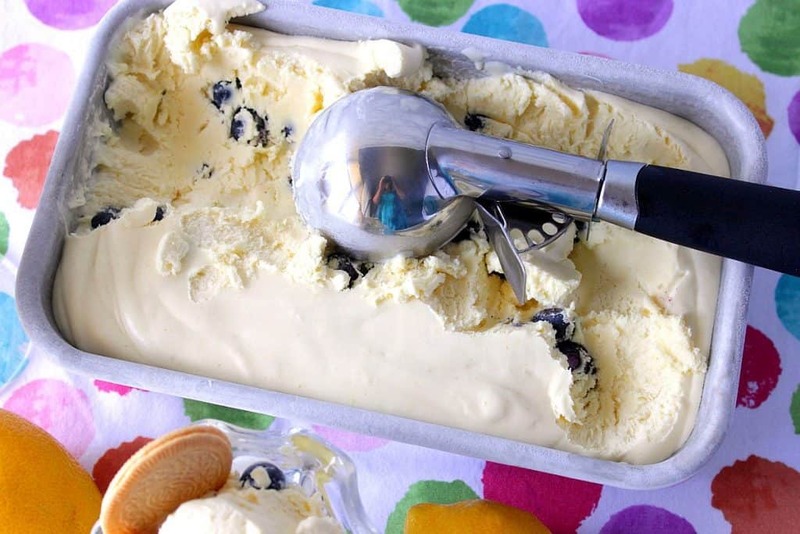 I think when you see the ease in which a no churn ice cream is made, you’ll agree that an ice cream maker (while it still has its place), is no longer a necessity when it comes to making delicious ice cream at home. 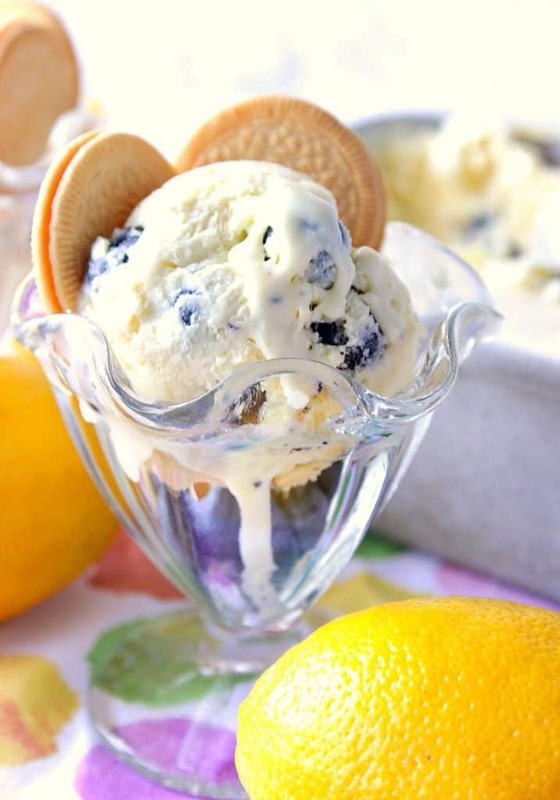 This recipe for Luscious Lemon No Churn Ice Cream calls for 1½ cups of lemon curd. You can use homemade lemon curd, or you can purchase it from the store. If you’re using store bought lemon curd I suggest you give it a taste first, and if the lemon flavor isn’t as bright and vibrant as you would like, stir in a teaspoon or two of fresh lemon zest. You’ll be surprised at what a difference it makes! One of the things I always do when I’m making no churn ice cream is I add a little bit of alcohol (no more than ¼ cup) into the whipped cream and sweetened condensed milk mixture. I learned this trick from Martha Stewart. She was the one who taught me that a little bit of alcohol helps to keep the ice cream soft and creamy, and it helps to keep the ice crystals down. For other recipes I’ve shared of no churn ice creams in which I’ve included alcohol are Sweet Corn Butterscotch Ice Cream where I added butterscotch schnapps into the mix, and this one for Toasted Coconut and Pecan Ice Cream where I again incorporated Malibu rum. And, coming up next week I’ll be sharing two additional no churn ice creams in honor of #SummerDessertsWeek that I’m really proud of. One will be for a Triple Chocolate Cherry Ice Cream where I incorporated Kahlua into the mix. And the other no churn recipe I’ll be sharing next week will be for a banana walnut ice cream (which I haven’t made yet), so I’m not 100% sure what alcohol I’ll incorporate just yet. Stay tuned to find out, and come back to revisit me the week of July 24th – July 28th. 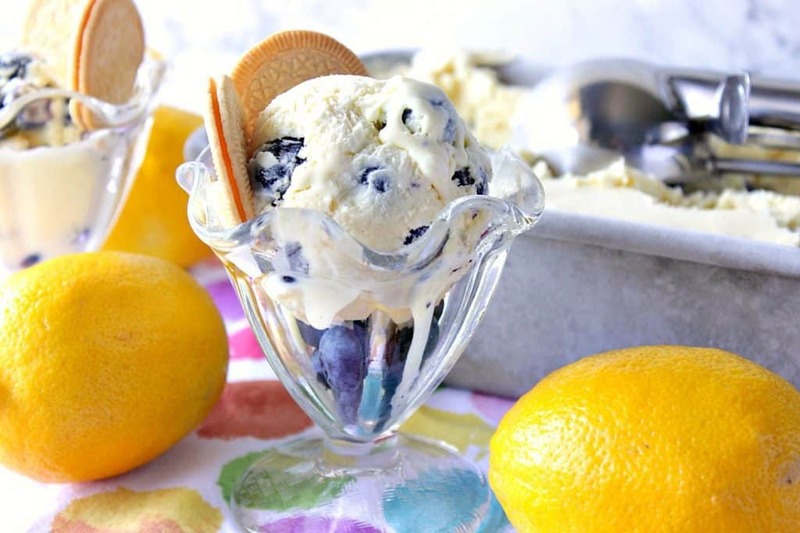 Making Luscious Lemon No Churn Ice Cream with Blueberries & Malibu Rum takes about 15 minutes to make, and at least four hours to freeze. If you’re ready, let’s start. Oh, I forgot to mention that once you have this ice cream mixed and ready to freeze, it may be hard to stop yourself from sampling it before you actually get it into the freezer. Well, maybe that was just me, but trust me, after only one taste you’ll be hard pressed to stop eating it! …and vanilla. Stir lightly, and add the blueberries. Stir gently and then pour the ice cream mixture into a loaf pan. Freeze for at least 4 hours and then serve as desired. Here's a frozen lemon dessert that isn't a sherbet or sorbet. 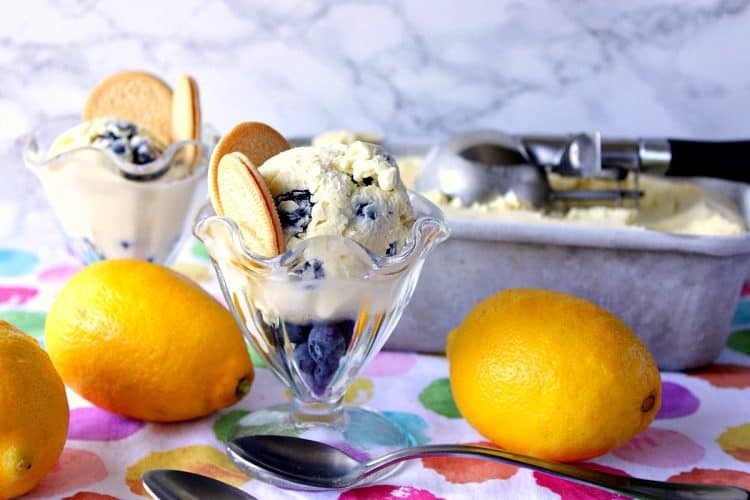 Luscious Lemon No Churn Ice Cream with Blueberries and Malibu Rum is rich and creamy with just the right amount of tart and sweet lemony flavor. In a large bowl, use a hand mixer o high speed (or stand mixer) to whip the heavy cream into soft peaks (will take approximately 4 minutes). 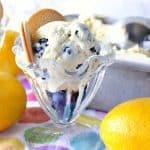 Switch to a wooden spoon or spatula and gently stir in the lemon curd, sweetened condensed milk, rum, vanilla, salt, and blueberries. Pour the mixture into a loaf pan and freeze for at least 4 hours before serving. 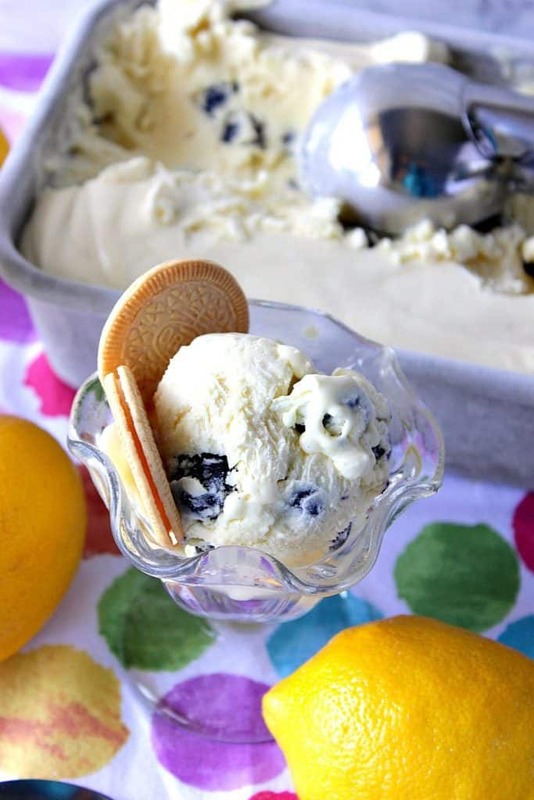 I’m coordinating this recipe for Luscious Lemon No Churn Ice Cream with my hand painted HP wine glass which is available for purchase in my shop if you’re interested, because there are just some things that never go out of style… like ice cream, and Harry Potter. 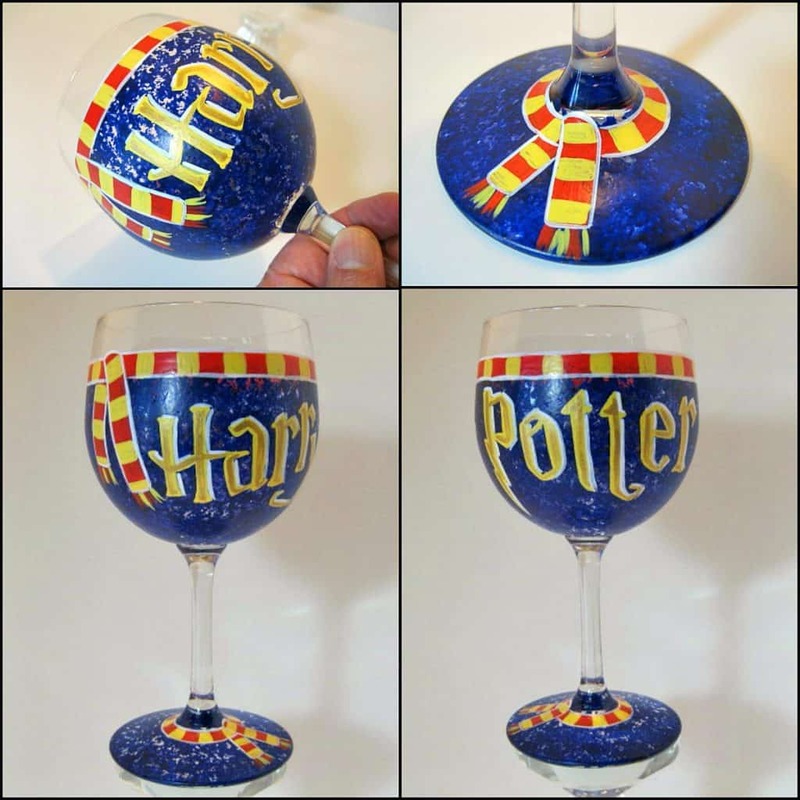 All of my hand painted glassware items are painted to order and unique. Each item comes in its own gift box ready for gift giving. All items can be personalized (if requested), at no extra charge. Custom orders are always welcome. Please contact me to discuss your design and for a price quote. For additional information regarding Kudos Kitchen, please follow me on: FACEBOOK, PINTEREST, INSTAGRAM, TWITTER & YOUTUBE.